Last night we made a shepherd's pie that didn't have enough mashed potatoes...so it kinda turned into shepherd's pie soup/mush. It was still good...just not as originally expected. We only had about a pound of mashed potatoes left over from something last week. We froze it, and defrosted it for this, and we also used way more veggies, which is perhaps why this turned out more soup-y and less pie-y. We also used our smaller rice cooker/steamer/slow cooker combo, which is smaller and gets much hotter, but it may also not cook as well - which may also be the reason we ended up with "mush". 1. In a skillet over medium heat, warm olive oil. 2. Add onion and cook, stirring, until translucent, 3 minutes. Add garlic and cook 30 seconds longer. Add beef, increase heat to medium-high and cook, breaking up chunks, until meat is cooked through and beginning to brown, 8 minutes. Stir in tomato paste, Worcestershire, thyme and 1/2 tsp. each salt and pepper. In a small cup, whisk cornstarch with 1 cup water. Add to skillet and cook, stirring, until liquid thickens slightly. Remove from heat; transfer to slow cooker. 3. Layer vegetables on top of meat; top with potatoes. Cover, turn slow cooker to low and cook for 3 hours. It actually still tasted really good. We had a warm meal after Kaspian's swim lesson! 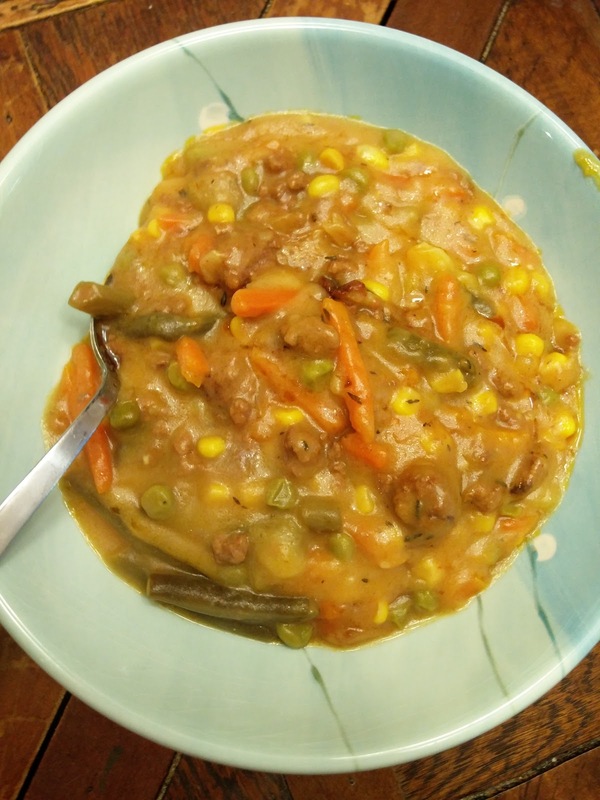 It failed as a shepherd's pie and turned into mush. He was very sad there were no mashed potatoes for dinner. Use pearl onions. We love pearl onions. Definitely use more mashed potatoes and maybe less veggies.